JIM: Hasn't a single word I've told you sunk in, for Pete's sake? He asks what the police are planning to do, and Todd admits that they're probably going to charge him. 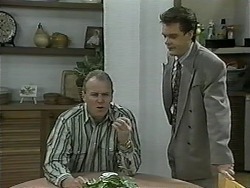 Jim snaps that he bets the *other* boy isn't on a good- behaviour bond; Todd could find himself in a boys' home. 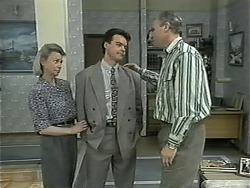 Joe opens the front door to Dorothy, and invites her in. She tells him that wanted to see him just for a moment. Joe says he's a bit nervy about court tomorrow. Dorothy hands him an envelope and explains that it's a character reference. Joe, looking taken aback, tells her that he really appreciates her thinking of them like this. 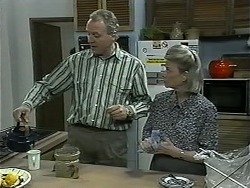 In the kitchen, Jim is ranting at Helen that he never had this problem with Paul and Scott. Helen asks him if he doesn't think *Josh* might have had an influence on Todd. Jim just sighs that he'd better ring Annette and let her know what's happening. Paul comes in through the back door at that moment and tells his father that he needs to talk to him about a few things. Helen explains to her grandson that this isn't the right time, and explains about Todd. Helen heads off to see Dorothy. Jim goes on at Paul in frustration that it's like nothing he's ever said to Todd has ever sunk in; it's one thing after another. Paul tries to start telling him about Christina, but can't get a word in edgeways! Helen has turned up at No. 30, but Ryan tells her that Dorothy isn't there. Helen comments that she was hoping to have a chat. Ryan mutters that his aunt hasn't been very chatty over the past couple of days; she's probably had another tiff with her boyfriend or something. 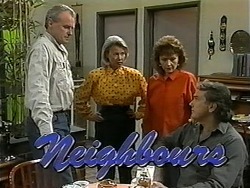 Helen asks in surprise if Dorothy has been out with John Brice again since she turned down his proposal. A look of shock crosses Ryan's face briefly. He then recovers and remarks that John must have felt pretty weak when his aunt said no. They sit down at the kitchen table and Helen shrugs that Dorothy didn't have much choice, did she? 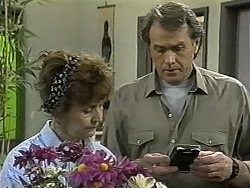 She asks Ryan if he remembers Dorothy's husband. Ryan replies that he doesn't know anything about him. Helen comments that the situation obviously still irritates her; she had no idea Dorothy was still married. A further look of shock crosses Ryan's face. Helen heads off. DOUG: Not now dear – I'm tidying my sock drawer! Pam, however, explains grimly that she found them in Cody's schoolbag. Doug takes the box and looks at Pam in disbelief. CODY: You went through my bag? That is an invasion of privacy. PAM: All right – then how do you explain how a packet of ten condoms now only has eight left in it? Cody shrugs that maybe the other kids grabbed a couple while they were being passed around. Doug says he thinks it's time they got Todd round. Dorothy is packing away shopping in the kitchen when Ryan comes in. He tells her that Mrs. Daniels was over earlier, to see how she was; he told her that his aunt had been moping around a bit… and Helen commented that it was probably because she turned down John Brice's proposal. Ryan asks his aunt why she didn't tell him. Dorothy replies bluntly that there was nothing to tell; she has no desire to get married – and she doesn't wish to discuss it further. PAUL: Bit of a flop, really. Didn't enjoy myself at all. PAUL: Oh, long story. But, things really started to pick up when we got back! PAUL: Well, the truth is, gran, I've had this thing for Christina for some time, and… well, she didn't show the slightest bit of interest while we were away, which is probably *why* I didn't enjoy myself; but as soon as we got home, I discovered that she feels exactly the same way about *me*. PAUL: Mm. Problem now is I'm a bit confused because, well, I don't know if we really know what we're getting ourselves into. HELEN (frowns): Yes, it could be awkward – living and working with the twins and having a relationship with one of them. PAUL: No, that's not what bothers me. I just don't know if I'm ready for another relationship yet. HELEN: You mean after Isabella? PAUL: Yes, I'm still bitter about that. Helen points out that after all the things Christina did to *expose* Isabella, it's obvious that she cares about him. She suggests they just let their relationship develop naturally and see what happens. Todd is at No. 28, where Doug is demanding to know where the condoms came from. Todd shrugs that maybe some idiot put them in Cody's bag, or maybe they just fell in. Cody chips in that she's already told the truth; her parents just don't believe her. Todd snaps that they don't want to *know* the truth; they just want to think the worst of their own daughter; how can they not trust her? Jim growls at Todd that he's not one to talk about trust after all the promises he's broken; if the police had charged him today, it might have taught him a lesson. Doug asks angrily if Todd has been in trouble *again*. Jim nods that he has, unfortunately. 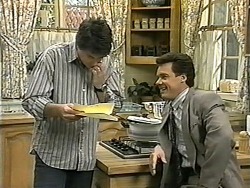 Doug tells Todd coldly that he wants him to stay away from his daughter. Jim tells Todd that he's let him down badly. 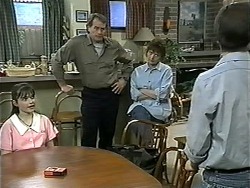 Cody looks at her mum, but Pam shrugs that she and Todd have brought this on themselves. Ryan is at No. 26 with Helen, where he tells her that Joe's given him a list of jobs that need doing while he's doing this court thing, and he's just trying to organise what days he should do them. He then says he was wondering about when Helen came over to see his Aunty Dot earlier… she mentioned his Uncle Colin, and he asks Helen if she knows anything about him. Helen just replies that he seems to be a closed book; the couple of times she's brought up the subject, Dorothy has behaved very strangely. She adds that she's more than a little intrigued as to why. Ryan admits that he didn't know Colin was still alive, let alone married. Paul has turned up at Joe's and hands him a character reference. Joe thanks him gratefully. Paul tells him that there's work at Lassiter's for as long as he needs it. Joe reads the reference and thanks Paul sincerely. TODD: You mean run away? CODY (nods): What do you reckon? Ryan arrives home and Dorothy tells him coolly that she's put his dinner in the oven. Ryan asks her bluntly why she didn't tell him that Uncle Colin is still alive and that she's still married to him. Dorothy shrugs that she didn't know he was so interested in her personal life. She goes on that it's not really not any of his business. Ryan retorts that it's *his* family too; he's got a right to know. Dorothy sighs that it's not something she wishes to dredge up after all this time; it's been buried for twelve years and she wishes it to stay that way. 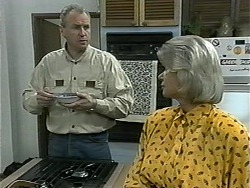 It's the next morning and Jim joins Helen in the kitchen, asking her if Todd is up already. Helen replies that he's still in the bathroom, but Jim says he can't be because *he* was just in there – and he's not in his room. He shrugs that he's probably ducked off to school early – scared of another confrontation, he bets. He adds that he's going next door to look for him. PAM: Doug – Cody's *gone*. DOUG: What do you mean, gone? PAM: The bed is stuffed with pillows; she's *gone*. 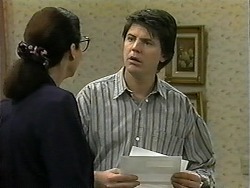 At that moment, Helen comes in and tells Jim that Todd's backpack his missing; she's checked his room and it's not there. Everyone looks at each other in concern.